I was standing listlessly at a vantage point near departure gates at Manila Domestic Airport terminal. It was a hot and steamy day outside and I had that unpleasant feeling of wet clinging clothes reminding me of my exertion in dragging heavy luggage to the check in counter outside departure lounge. I always liked to be at the airport before scheduled check in time as miracles sometimes happen and names on the list during a previous day check can disappear overnight. You need to be there to help “find” the missing name again. It is of particular importance if that name happens to be yours, and your journey urgent. 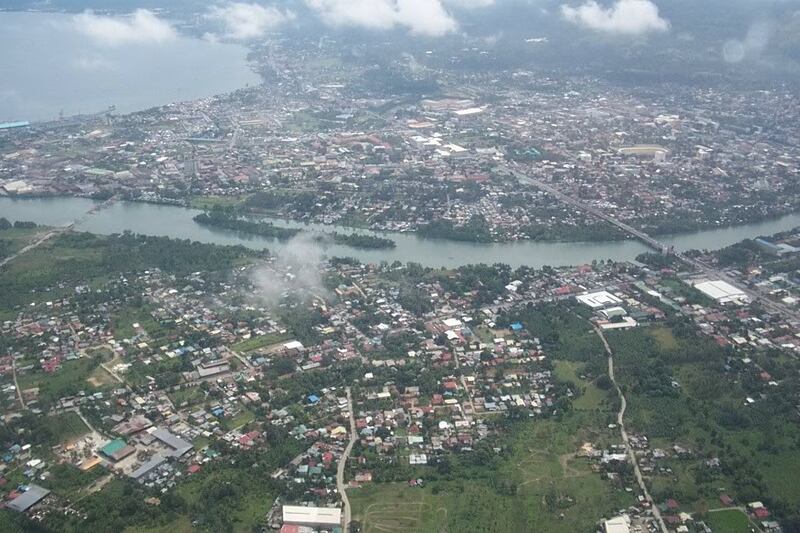 My ticket was booked straight through to Cagayan de Oro, jewel of the Island of Mindanao. There safely tucked away in my carry on luggage was a computer and lecture notes. Everything was ready for my series of in house business training sessions and I was inpatient to get there and review my notes before starting lectures next day. I watched green numbers flashing above each departure exit. My ticket gave no indication as to the gate through which embarkation procedures would begin, and as I’d been caught out in other Asian cities where departure information was given over loud speakers in a local dialect I made it a habit to move close to the ticket checker and see if passengers were going my way. Manila was a big improvement. They had flashing numbers to guide ignorant tourists at departure gates. Out of the corner of my eye I noted a little party of three led by a short woman of commanding appearance. They were inspecting carry on luggage and at each inspection pause the inevitable argument ensued with grumbling passengers being redirected to the check in counter with surplus carry on baggage. I relaxed. It couldn’t happen to me because I was within my size and weight limit. I was being Mr. Clean for a change! But it was not to be that simple. The small lady inspected my bag and ordered me back to the check in counter. “Absolutely not, this has to come with me. It contains a fragile computer and my lecture notes which I dare not lose as I commence teaching tomorrow!” I protested that I’d carefully weighted my carry on luggage and it met size and weight requirements. So I joined the rest of the grumbling passengers and remonstrated with this lady. She had to be mistaken as I’d been traveling by air around the Philippines and no one had challenged me because my carry on luggage had wheels. Furthermore I’d seen people wheeling their cabin baggage out some of the other departure gates within the time this energetic lady had been conducting her walk around the departure lounge. None of this logic made any difference to the little bundle of energy and she stood her ground. To my suggestion she make an exception to her rule for the sake of good tourist relations she extended her hand and asked to see my ticket. She studied it briefly and motioned for me to follow her. I asked where we were going. “In that you say you must travel with your hand luggage I’ll see you get a refund on your ticket and you can find some other way to travel,” she stated matter of factly! She had me there. I must be at Cagayan de Oro next morning, a lot of expense had been incurred preparing the venue and bringing people for the series of lectures. I deposited my hand carry at the counter and made the clerk aware of my problem. That luggage must arrive with me on my flight. Well, happy to say, it did! The short powerful lady who had been watching to see I followed her instructions nodded pleasantly and moved on to terrorize another traveler. I was completely miffed and decided to buy something to read and keep my mind occupied during the one hour and fifteen minute flight. Why not buy a book on Cagayan de Oro? I’d discovered an audience likes to know their lecturer has taken the trouble to read up on their city. So I paid my Paso and tucked the book under my arm resuming my scrutiny of the gates. The book was interesting and I soon forgot about my anxiety over the carry on luggage Around 377 AD, natives of Cagayan where already living around the vicinity of the Huluga Cave, 8 kilometers from the present day Cagayan de Oro. The settlement was known as Himologan. In 1622, two Spanish Augustinian Recollect missionaries came in contact with the natives of Himologan. The missionaries observed that the natives were polytheistic animist and paid tributes to Sultan Muhammad Dipatuan Kudarat, the Sultan of Maguindanao. In 1626, Fray Agustin de San Pedro persuaded the chief of Himologan, Datu Salangsang, to transfer his settlement down river, the present day Gaston Park. Fray Agustin later fortified the new settlement against Sultan Kudarat, who sent warriors to regain back his lost tributes. On February 27, 1872, the Spanish Governor General Carlos Maria de la Torre issued a decree declaring Cagayan the permanent capital of Segundo Distrito de Misamis. During this era, the name of the town was known as Cagayan de Misamis. On January 10, 1899, Cagayan de Misamis celebrated its independence from Spain and joined the Filipino government of Emilio Aguinaldo. It was the second time the Aguinaldo government was declared and the new Philippine flag was raised in Mindanao island. By virtue of the 1898 Treaty of Paris, Spain ceded the Philippines to the United States. This caused friction and resulted in the Philippine-American War. In March 31, 1900, the Americans invaded Cagayan de Misamis and took over the town. On April 7, 1900, fighting erupted in the town center led by General Nicolas Capistrano and Filipino resistance fighters. Eventually the Americans won the war. Cagayan de Misamis was slowly transformed as the economic center of Northern Mindanao with the establishment of the Philippine Packing Corporation, presently known as Del Monte Philippines Inc.
World War II erupted and on May 1 1942, Japanese forces invaded Cagayan de Misamis, destroying most of town. Cagayan was finally liberated on May 10, 1945 but suffered heavy aerial bombardment from the Americans. So there I had it all at my fingertips. Enough information to show my students I was a serious student of their culture myself. The series of lectures went well and my students departed satisfied. I’d been liberally fed with all the delicacies of Mindanao during that lecture period and now had to contemplate a serious exercise program to reverse weight gains. But on the day of departure my sponsor arrived with news bad weather conditions had caused Lumbia Airport to cancel domestic flights in and out of Mindanao. Well one more day of being fed and pampered wouldn’t be hard to take. But weather conditions didn’t improve and Mindanao remained a no fly zone. It was decided I should take the ferry to Cebu, and an onward flight to Manila where I could try and sort out my delayed international flights. So I was deposited at Macabalan seaport and a ferry ticket purchased for the sea crossing to Cebu City. I have to confess feeling a mite apprehensive as on previous visits to Philippines news headlines had trumpeted news of ferries capsizing on an island crossing with considerable life lost. I remembered similar stories on my trips over the Padma River in Bangladesh during the swelling of that mighty river during Monsoon Season. Conventional wisdom was passengers hearing of some notable event to be seen from one side of the boat all rushed there and tipped the balance of the ferry so it turned turtle. Sometimes it’s not good to listen to folk tales, especially when traveling by ferry! My assigned bunk for the overnight crossing was under deck. I’d always traveled on deck in Bangladesh thinking that if my boat went under I’d have an opportunity to reach shore. Here I was below deck! Now my assigned bunk was constructed in a rather unusual manner. Two beds together top and bottom with the opportunity to eyeball your neighbor at close quarters. I swung into my assigned bottom bunk and came face to face with a young woman on the slab next door. She stared at me momentarily, then meaningfully grabbed her luggage and deposited it between her side and mine with a defiant look. The look said cross this line and you’re dead meat! Instead of being insulted I felt pretty good about that. Imagine, at my age this young woman found me to be dangerous. I liked that! I settled in and decided to try and get some sleep. In spite of the tempest outside the boat had commenced our journey with a pleasant slight rocking forward movement. A half hour out though things changed. We were now on the ocean and away from the protection of the bay. The ferry rose up and crashed down lurching from side to side like a serpent desperately trying to escape a predator as the tempest raged. Those standing were being thrown around the huge cabin and soon a chorus of retching could be heard from all directions. My saliva glands began their meticulous manufacture of that metallic substance proceeding the embarrassing moment all fear on an ocean trip. Then I tried an experiment. When the ferry rose on a wave I’d breathe in deeply, and when it crashed I’d exhale sharply. The strange feeling in my mouth subsided, and for the rest of the night I followed my newly discovered breathing system, sleep being out of the question. Retching continued during the night and the smell in that cabin was horrendous but I didn’t succumb. Then in the early morning as the sun’s rays caressed a now tranquil ocean the city of Cebu slowly came into sight, and what a glorious sight it was to the sleep deprived and seasick travellers on that ferry from Cagayan de Oro. Gratefully we all disembarked, weary travellers greeted their relatives as I hailed a jeepney and headed for the airport and my flight to Manila. Oh, and before I forget! The flight attendants in Cebu City didn’t mind in the least as I took my wheeled hand carry luggage with me onto the aircraft. Such is life! Wow Ian. What a beautiful place….must admit I had never heard of Cebu until I read your story. Thanks so much. Hi Sue. It’s comments like yours that causes me to reflect on just how fortunate I’ve been to visit places that the average person could never dream of visiting. Best regards. What an experience! Your mentioning Bangladesh brought back many great memories! Even ferry rides in that country. Back in the 1970’s Bangladesh did not have the road systems they have today, nor the bridges over that delta region. So it was mostly travel by ferry or those tiny craft they paddle with one oar. Things are much better to get around the country today. Another excellent traveling tale, Ian, filled with suspense, your steady personality and sea sickness!!! That luggage examiner was drunk on her own power, but when encountered in their own element, they do indeed hold all the cards! Yes that powerful lady experience has stuck in my mind. It was so out of character with the peoples of the Philippines who are so generous and helpful. This lady was the exception. It’s a wonderful country to visit and there’s so much to see and experience.